I’m not sure why or when Joe Flacco became “Joe Cool,” but this is one that’s had a hard time holding weight this season. And didn’t he steal that from Joe Montana anyway? Lately I think “Joe Inconsistent” would be more fitting. 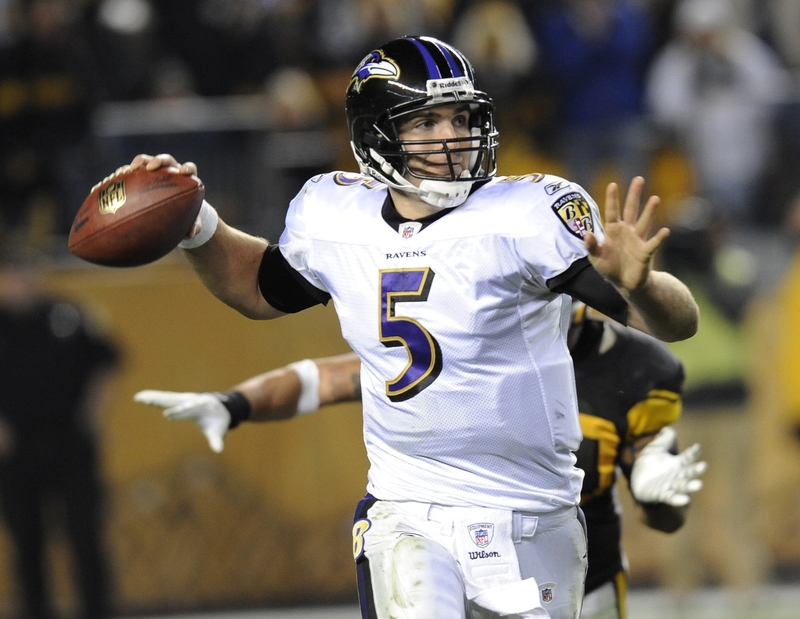 In Week 1, he threw three touchdowns to help the Ravens blow out the Steelers 35-7. He followed that game with two interceptions and a 197 yards in a loss to the Titans. A 389-yard, three-TD performance in Week 3 was followed by an abysmal game against the Jets (10-for-31, 163 yards, INT). The seesawing continued in a Week 6 win over Houston (20-of-33, 305 yards) and in a Week 7 loss at Jacksonville (137 yards, TD, INT, 3.6 average yards per completion). After 6 weeks of up-and-down play, Flacco finally began to look more “cool” than cockeyed. With 48 seconds left in a tie ball game against Arizona, Flacco hit wide receiver Torrey Smith for a 36-yard gain, setting up Billy Cundiff for the game-winning field goal. On a similar play this past Sunday, Flacco found Smith again for the go-ahead 26-yard touchdown. As I watched the final drive, I was surprised to see how poised Flacco looked against what at the time was the NFL’s top-ranked defense. This definitely didn’t look like the same quarterback who completed just over 30 percent of his passes in Week 4. Carefully side-stepping pressure, he completed 7-of-13 throws accounting for all 92 yards. Even when Smith and Anquan Boldin dropped sure completions, Flacco stayed cool and continued to pick apart the Steelers defense. Thanks for clearing that up, coach. I always thought “Joe Cool” was Charlie Brown’s albino dog. But now I know he’s a man and his name is Joe Flacco. 2nd and 10 at the Ravens 8 – Anquan Boldin was covered by Steelers corner William Gay for most of the drive. Boldin took advantage of this matchup and caught four balls for 51 yards. His first reception started the drive off with a 21-yard gain and a first down. 4th and 1 at the Steelers 49 – The Ravens needed this conversion to keep the drive alive. Again the Boldin-Gay matchup was exploited by Flacco for the first down. 2nd 8 at the Steelers 37 – Flacco went for it all on this throw to Torrey Smith. He avoided pressure by stepping up in the pocket then fired a deep pass to the end zone that just slipped out of Smith’s hands. 3rd and 8 at the Steelers 37 – This time the Steelers put Ike Taylor on Boldin but to no avail. Anquan ran an out route for 11 yards and stopped the clock by getting out of bounds. 3rd and 10 at the Steelers 26 – The 13th play of the drive was the dagger for the Steelers. Again Flacco looked deep for Torrey Smith, only this time he made the play and hauled in the 26-yard touchdown. Pass interference was called on the play and after the game Smith said that when he saw the flag, he gave the corner a little shove to gain separation. It was a smart play by the rookie and an impressive drive by “Joe Cool” and the Ravens. For in-depth analysis of this drive, check out Brain Baldinger’s Drive of the Week.